Some days ago booxtor from the ereader store sent me the onyx boox t68, the onyx boox m96 with pen support and the boox m96 with touch support (which is still a prototype). I already own an old (but rooted) Sony PRS-T1 and a pocketbook 903. The sound in the video is really bad, some sentences got lost are very hard to understand. Sorry. This is the reader that I use for reading fiction, and sometimes for reading technical EPUBs. It works quite well for those purposes, is readable, fast enough. Reading PDFs is only a possibility in theory. The screen is just too small for my taste, and the resolution is definetely to low. One could argue that I could put the device in landscape mode, but to me that misses the point of pdfs - to actually see the whole page as it was meant to be seen by the editors. This reader is slightly larger then the Sony (6.8 inch vs. 6 inch), has a much higher resolution, and also has a backlight. It runs on a modern Android (4.0.4), which is easily rootable, and has the google play market installed. Which means that I am not bound to the preinstalled apps, but can use it basically for whatever I like (including my own apps which are built using phonegap). Reading Epubs works as expected, well, mostly. The preinstalled fonts are not that great, and even though you can install your own fonts (see the manual), sometimes selecting your own font won't override the default font setting. A really big surprise to me is reading PDFs on the device. It actually works. The page is still a bit small (after cropping, which is nicely supported on the device), but given the high resolution the text is definetely good to read, and I think one could use this in real life for pdfs. I would recommend to go to the linked image, and scale it in your image viewer so that the devices appear in real size (the height of the reflecting left egde of the sony is 17 cm). The Pocketbook 903 is the oldest one of my devices, and the only one that doesn't use android as its operating system. The handling of the PDFs is ok, with the firmware that I use. The screen size is great. The text quality is ok - not great, but usable. Taking notes or doing annotations is something I gave up upon, it just doesn't work well enough. In 'real life' I usually end up reading technical EPUBs on the 903, basically for the screen size. A really nice experience! (I would prefer a boox m96 though). The boox m96 is the successor of the onyx boox m92, which I tested a while ago. The hardware side seems to be quite comparable, the software is different though. First of all, it uses Android, with google play preinstalled, which allows for custom ebook and pdf readers (and other apps). This is a huge improvement. Right now, realistically, I wouldn't get another ebook reader with an open (or rootable) Android. Once the hardware is good enough, the software support becomes the bottleneck. This is pretty much solved in the Android Eco System. Hey, you can even install the kindle reading app - so you have the free epub world, the PDFs and can still use Amazon's content (if one desires to do so). Second, it's reader app has improved. Handling and cropping of pdfs is actually really usuable right now, and I can recommend using the device for reading PDFs. Now, the question is - touch input or pen support? In the video below I compare scribbling and highlighting of text in PDFs. In my opinion there the pen is the clear winner. Having said that - I don't know how much of that I would be doing anyhow (I haven't experimented with the export of notes yet, and having the notes stuck on the device is pretty much useless to me). And when it comes to 'everyday' handling I like the touch support way better. It feels much more natural, is faster, and I can't lose a pen (and don't need to carry it either). Given my strong preference for open android readers (because of the software support), and having learned what difference a good screen resolution makes - I would prefer the onyx devices of the sony or the pocketbook. Next question is size. When it's only about epub, and mostly fiction, I would stick to the t68 (also given it's backlight). For technical epubs or pdfs the question is harder. The t68 is good enough for the occasional pdfs, but for everyday, allday reading of pdfs the screen is still to small. When reading lots of pdfs, the question left is: do I want to make annotations (pen), or rather have better handling (touch). Thanks for the useful review. I have recently broken the screen of my [rooted] PRS-T1 and looking to replace it. 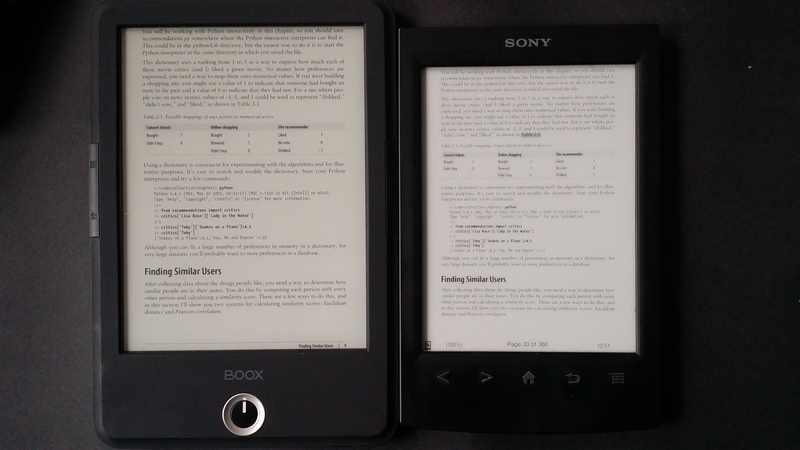 I've noticed that reviews from last year on the-ebook-reader.com suggested that the Onyx T68 was very buggy. However it seems to have had many firmware updates since then. Is it now working well or does it still have everyday bugs? I actually don't know - I only had onyx readers for a short while, in order to test them.